Phenolic compounds (PCs) of either natural or anthropogenic origin are pollutants often occurring in industrial, agricultural, or domestic wastewaters, which are toxic for living organisms even when present at concentrations lower than 1 mg/L in aquatic media. Different physicochemical or biological strategies have been designed, tested, and applied for the removal of PCs from wastewaters; biological approaches are most often preferred for their efficiency at a lower cost. The ability to remove PCs of various types of microorganisms (bacteria, archaea, fungi, and microalgae), either isolated or in consortia, has been widely described in the literature. Photobioreactors (PBRs) are a reliable and efficient technology to treat complex wastewater effluents, based on the mutualistic relationships among microalgae and bacteria. Microalgae-bacteria consortia provide a variety of advantages for wastewater treatment, since photoautotrophic microorganisms deliver O2 to heterotrophic bacteria while fixing the CO2 generated by the mineralization of organic matter, thus reducing aeration cost and greenhouse gas emissions. Since microbial communities determine the success of the biological strategies for the removal of pollutants in PBRs, different biotic and abiotic factors influencing their diversity and functions are critical and must be considered. 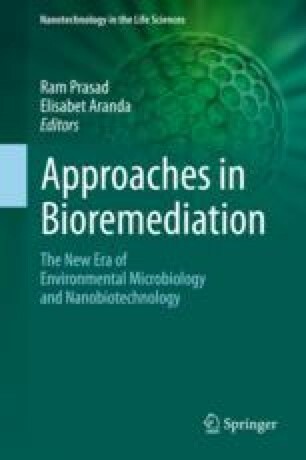 In this chapter, we focused on the current knowledge regarding the potential of microalgae-bacteria consortia for the effective treatment of PCs in wastewaters using PBR systems.